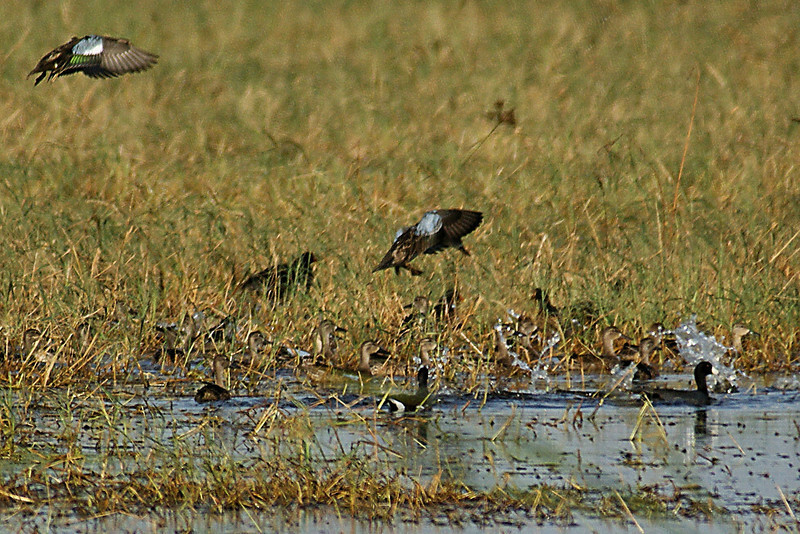 The winter duck migration season of 08/09 was the first opportunity to photograph wild ducks and mostly it was done at San Bernard National Wildlife Refuge. From the thousands of shot taken, I have reviewed them and selected a little less than one hundred. The criteria was to select those photographs that would, when viewed in total bring to the person looking at this gallery a vicarious experience that would come as close as mine. Two different cameras were used, but the same lens. All shots were saved in camera as JPEG and all post-processing was in Corel. Some of the shots were from 20 to 50 feet, but my, especially the flying shots were over 100 yards. Those taken at the far distances leave only a small amount of pixels to capture there form, small abstract patches of color tones, that still tell the viewer they are seeing ducks. Of course, the ones that are taken at the closer distances reveal a little more detail. There was a variety of weather conditions, light conditions, time of day. There were clear sunny days, cloudy, overcast, hazy. Some species came to stay for awhile. Others came and left after only a short while. Some of the species had familiar names, others strange, Most I had only seen in books. For the most part, it was a new experience even though I had worked with and been acquainted with duck hunters all my life. Can hardly wait for the migration to start for 09/10. I just hope that there will be some water. The last time I was there a month ago, there was absolutely no water.